Looking to balance your karma? Are you drawn to the healing arts or seek to help others? Dragon as a Spirit, Totem, and Power Animal can help! Dragon teaches you responsibility for your soul and how to live a life of honor. Delve deeply in Dragon symbolism and meaning to find out how this animal spirit guide can motivate, stir, and enlighten you. Among animal spirit guides Dragon is arguably the most ancient and imposing. In the Far East, the Dragon symbolism and meaning is all about the authority of the Emperor (who for a long time in history was the designated “dreamer” for the entire Country). In this setting and many others, Dragon rules the elements and can take whatever form he wishes. Metaphysically this equates to the Shamanic goal of controlling elements as well as being able to transform into various Power Animals and enter the dream time. In the art of Feng Shui, Dragon represents fortune, authority, growth, luck and development. In Europe these formidable Beings symbolize the ability to rise over circumstance and see things clearly. Dragon symbolism and meaning also ecompasses the primordial natural forces on all planes of existence, longevity and the most earliest of magicks some of which have been lost to time. The never ending battles between nights and Dragons reflect the inner struggle of human kind to come to terms with the Spiritual or Ethereal nature. There’s a sense of mystery tied to Dragons, which can be the Greater mysteries too. Consider the Loch Ness Monster is, in theory, a water Dragon and protector of the lochs. Local stories also tell of a great air Dragon that lives beneath the Hebrides and comes out on sacred days to survey the standing stones throughout the region. Those who see this creature are considered somehow “Dragon kin.” In this respect Dragon energy connects with that of healing and power stones, as well as the Ancestor realm. Dragon Spirit is drawn to people of intellect, dignity, contagious enthusiasm and authority. Dragons guide such individuals toward brilliance and, indeed, enlightenment. 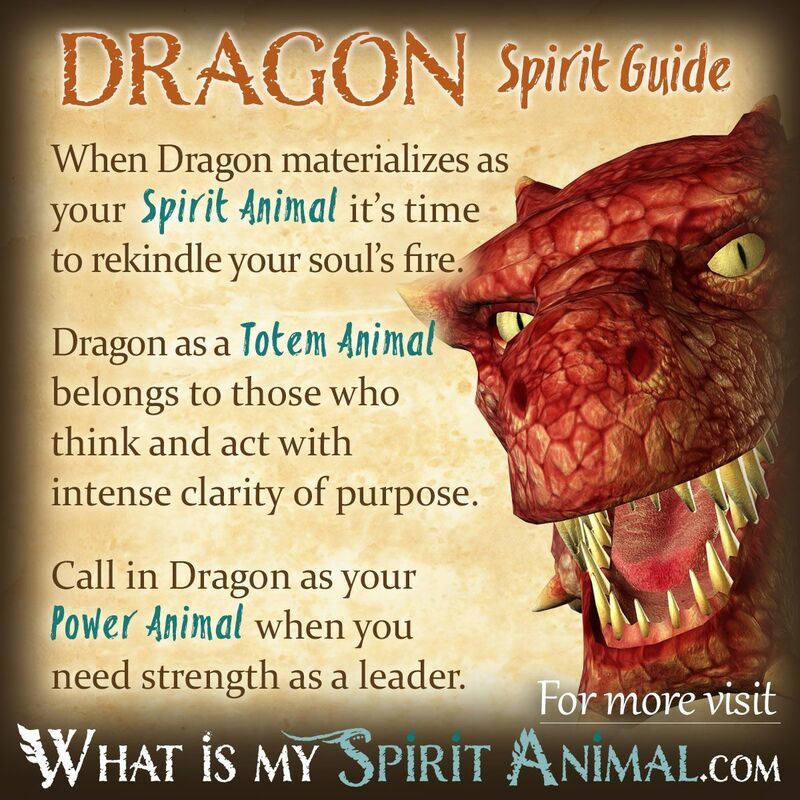 In this setting your Dragon Spirit Animal teaches you to roar – finding your voice, being heard and truly understood. Dragon is a rare and powerful Spirit Animal, and you may find yourself quite intimidated by this creature upon initial introductions. There is no question that Dragon is worthy of your respect and honor, but She comes to you with good cause. Figuring out that purpose, however, can prove difficult. Dragon Spirits do not give up secrets easily – it’s part of the challenge. The greater the effort the greater the rewards. Fire Dragons – bring you lessons of self-mastery, creativity, mental keenness, alchemical transformation and leadership. Water Dragons – focus on what drives the ship of your life – be ready to put down unhealthy patterns and sail toward your fate. Earth Dragons – stabilizes and provides the key for sustaining your needs. Air Dragons – wrap you safely in his/her grasp and flies high. From here you gain greater perspectives personally and globally, untroubled by the winds of change. In Asian cultures – wood and metal are included as elements. In modern gaming – “elements” such as ice, lightening, and speed are coined ‘elements’ and ascribed as ‘types’ to Dragons. As in the legends of St. George and St. Margaret of Antioch (both Dragon slayers), Dragons represent the Devil. Spirit Animals always appear with your highest and best good in mind. Sometimes, that highest and best good can mean that you must face and ‘slay’ the Dragon inside yourself (addiction in any form, violence or rage issues, confidence and self-worth challenges, etc.). Or, conversely, the Dragon Spirit Animal may come when it’s time to face and ‘slay’ a ‘Devil’ who is doing harm to you and/or your loved ones, community, hearth and home, pets, etc. To be extremely clear, ‘slay’ is used as a metaphor – not as a prompt for physical, mental, or emotional harm. Those who have Dragon as a Totem Animal are fierce. This is not to say that others should be afraid of them nor they of themselves. Fierce, as an energy, can be incredibly positive. True, ‘fierce’ can also be incredibly destructive. Hopefully, you’ll use the Dragon that lives inside you only for thoughts, words, and deeds which are for the good of all. Remember, in both modern and ancient myth, Dragons are closely tied to the elements. The 5 basic elements are earth, air, fire, water, and spirit (aka aether or ether). Now, all Totem Animals ‘belong’ to an element. Fish to water, Bears to Earth, Eagles to Air, Lions to Fire, and so on. But, when something as large and seemingly ‘unbeatable’ as a Dragon is teamed up with an element, well, that’s P.O.W.E.R.F.U.L. Be sure that you recognize your Dragon type before identifying Dragon as your Animal Totem. Think, speak, and act quickly. Old soul – wise beyond years. Not afraid to speak your truth. Desires to rise above all circumstances. When Dragon is your Totem Animal, it can be easy to let ego take control. After all, who doesn’t want to be the biggest and baddest of them all? But use caution when identifing with Dragon as a your Animal Totem. Do not engage this part of yourself without a worthy cause. Dragon is an epic totem. So save it for the BIG problems or goals that seem otherwise insurmountable. Dragon appreciates those who do not use his energy imprudently. It is suggested that those working with Dragon totems learn as much about these Beings as possible. The more you know, the more you honor your totem and its ruling element the better you’ll understand its communications. Additionally if you have the opportunity to meditate with the carving in a cave – this is a mythical place of rest for Dragons. It’s a good way to connect. Don’t be surprised if your totem debates the finer points of an idea with you – it’s a way of bringing you greater clarity. Calling on Dragon medicine as your Power Animal is like having a key to the supernatural and the realm of true magick. It will take you time learning how to use that key effectively, however. All Dragon spirits have alchemical power, which means they hope to turn you into “gold” spiritually. This is a great gift, and one you should accept with both gratitude and humility. Invoking Dragon as your Power Animal means even greater responsibility for you Karmically. Dragon will protect you when you work for the greatest good, but woe to those who begin reaching for power greedily. This is a great way to lose your Power Animal and get burned by the Dragon’s fury at the same time. Dragon energy and medicine is particularly potent for those who wish to become healers and physicians – especially Acupuncture. We see Serpents / Snakes in traditional Native American lore, but not Dragons per se. Because Dragon myth and legend is so closely tied to Snakes, it can help you better understand Dragon as a Spirit, Totem, and Power Animal if you read all about Snake Symbolism and Meaning. Dragon symbolism plays heavily in the legends of the Celts where it is associated with all four elements and cardinal directions. To the Druids, Dragons represented vitality, the psychic self, ancient wisdom and the power of creation itself. Stories of Dragons protecting the secret and sacred entryways to other realms are common in Celtic and Druid folklore. It is no surprise to discover a Red Dragon on the flag of Wales. The motto roughly translates as ‘the Red Dragon leads us’. Unlike many European tales, Dragons have strong benevolent tendencies, only harming when evil rears its ugly head. Throughout Celtic realms what we call Lay Lines are called Dragon Lines. This ties Dragon Spirit to Geomancy and the forces that connect all things on the Earth together. Stonehenge is thought to have been the ancient resting ground for travelling Dragons. Gives the phrase, “ley of the land” whole new meaning, doesn’t it? The Anglo Saxon word for Dragon means “clear seer”. This implies that the Celts considered the Dragons as prophets and true seers with great wisdom. In fact, Seeing a Dragon was regarded as a great omen of good health and plentiful harvest. Even into modern times the Dragon is respected akin to the Gods as a protector of Mother Earth. Dreaming about a Dragon in a treasure cave represents those things you hold dear, or potentially things you hide from others. Dragons can also represent creation, power, sexuality, transcendence and primal forces that require care and regulation. To learn more about more specific Dragon dream symbolism, go to my Animal Dream Dictionary (be sure to read about Snake Dreams as they are so closely related to Dragon symbolism and meaning. Learn more about Dragon Spirit by reading What Do Dragon Dreams Mean? on WhatIsMySpiritAnimal.com! In the Chinese Zodiac, Dragon is one of the 12 animals which govern this particular astrology system. Even if Dragon is not your Chinese Zodiac Sign, it is important to read about the personality, traits and characteristics. By understanding all teachings and energies of Dragon, you’ll be more capable of understanding and integrating its messages and medicine. On my sister-site, BuildingBeautifulSouls.com, you can learn all about the Chinese Zodiac Dragon. Great read keep up the good works!!!!! The articles are Awesome and bring a-lot on insight & creativity. Not too long ago, I had a dream about dragons. I was sharing my powers with a dragon made of ink, and this time, it was on the verge of death. Its physical form got released, leaving just the inky soul. I absorbed it, acquiring powers beyond imagination. But I decided to give the power up to reincarnate the dragon, so I called upon the dragons of air, earth, water and fire through some sort of ritual dance. Once the dance ended, I was sorrounded by the four, and they all spit fire in unison, creating a vortex of flames. The soul I absorbed exited my body, lifting up high, where the rainbow of the flames then created black smoke, and it absorbed all of it. Then, it got engulfed in the flames, repelling me outside, creating some sort of multicolored, flaming egg, and some seconds later the dragon at the beginning revealed itself, dissipating the colorful envelope it was in. It came up to me and showed affection toward me, and I hugged them. We were happy. So.. what does it mean? Last night I had a similar experience…I felt a powerful surge of an immeasurable force. It was an amazing liberating feeling. I fell asleep & 20 minutes into my sleep I woke up screaming & running in a rage as if I was going to defend my house or attack whatever was coming for me. I relied on the spirit of itself to make itself known. “Dragon spirit now dwells within me. I googled Dragon spirit which lead me to this page. I told my gf that I reached a new spiritual plateau. I find myself wanting to meditate more because it connects me to the divine. It guides me & teaches me as I walk through out the day. I will be cautions how I use this new weapon & only when needed. I asked it to never separate from me. I Am Dragon! !